These are some of the most interesting cars available in the world's premier collector car auctions. Every year, top car collectors compete in the Pebble Beach Councors d'Elegance. Cars are judged and awards are given for the best restored and most beautiful collectible cars. With so many top car collectors in one place, Pebble Beach has also become a location for high-end collector car auctions. Theses are just a few of the most interesting cars being offered for sale at this year's mid-August Pebble Beach auctions. 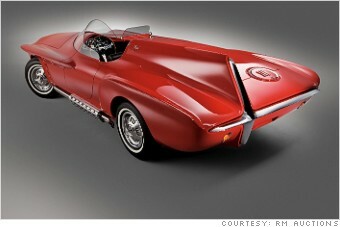 Designed by legendary Chrysler designer Virgil Exner, the XNR concept was seriously considered for production. Its design was inspired by Indianapolis 500 racecars and by the big-ruddered Jaguar D-type sports car. After making the show car circuit -- and appearing on the covers of Road & Track and Motor Trend -- the XNR eventually found its way into the Shah of Iran's car collection. After being sold again it ended up in Beirut just as the Lebanese civil war was starting. It survived the war in a series of underground garages as its owner moved it gingerly, time and again, out of harm's way. Finally, in 2008, it was shipped to RM Restoration, an affiliate of RM Auctions, which is handling its sale, to be restored to its present condition. There's no estimated value for this because, really... who knows?